Discussion in 'Online Games - News and Reviews' started by Kotsy, Aug 23, 2014.
introduces us to Spinderella. It's a grown up version of the old classic brought to you as an online video slot and highly enjoyable to play. The pretense of the video slot is comical and quirky. into a pumpkin. Players will love the multipliers along with quirky graphics. I find this slot to be a nice addition as it adds a little bit extra. or the number of lines to play. At a quick glance, it's self explanatory. The buttons are to choose are bright and easy to use. Always take a look at the paytable to see what you're playing for. she could increase your winnings up to 10 times and could appear more than once given you the possibility of a huge hit. Nothing better then getting multipliers in your winning paylines. Winning symbols include Spinderella Wild symbol, The Prince, Castle, Carriage, Red Shoe, Pumpkin, Ace, King, Queen, Jack, Ten and Nine. The Fairy Godmother is the Scatter symbol and can appear anywhere. Receive 3 or more and you will be off to a fairy tale of free spins. You could win up to 50 free spins. You'll also have an extra bonus symbol that will be an active Wild symbol during the free spins. You could receive the Prince, Castle, Carriage, Red Shoe or Pumpkin as your extra Wild symbol along with the Spinderella Wild symbol during the free spin feature. Should a winning payline include a Wild symbol, you could also receive up to 10 times the winning amount. The free spin feature could bring you a fairy tale of bankroll. Take your childhood fairy tale to the next level playing Spinderella at Stargames. Those good old classics are sure looking brighter as an adult. 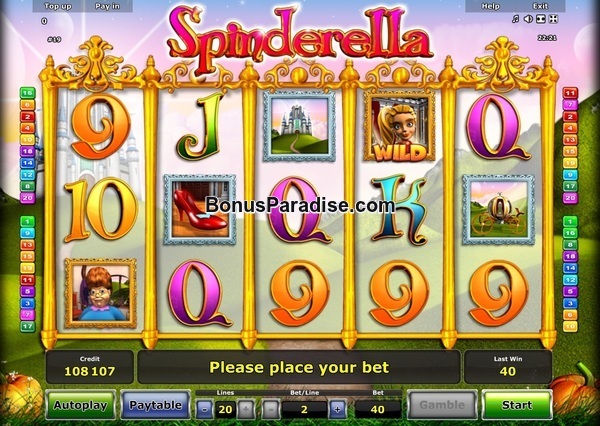 Spinderella Online Slot is now live at Stargames! Good Luck everyone...Looks very nice the Spinderella Video Slot from Novomatic!